The right filing cabinets are an important component of any office. Filing cabinets come in so many types and sizes that it can be difficult to know which one is best for your office needs. Here are some things to keep in mind when choosing a filing cabinet in order to select the right one. 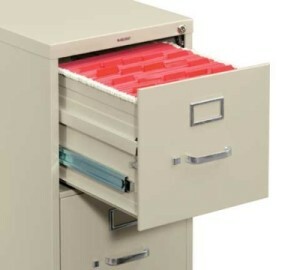 Filing cabinets generally come in letter or legal size. Letter-sized drawers hold documents that are a standard 8 1/2″ x 11″, while letter-sized drawers hold paperwork that is 8 1/2″ x 14″. If you rarely handle legal-sized documents, you can probably get by with a smaller cabinet, but you may want a larger one if you regularly handle both sizes of paper. You’ll also need to decide how big your filing cabinet should be. Vertical cabinets may be between two and five drawers high, while horizontal ones may contain only one or two drawers (but also vary in length). Buying a cabinet slightly bigger than what you need will help you account for future growth, and will prevent the need to place files in storage. When in doubt, it’s better to err on the side of caution and purchase a locking filing cabinet, since it only costs a little bit more to do so. Finally, you’ll need to decide what materials and color would best match your office decor. Fortunately, filing cabinets come in a wide assortment of styles, materials and colors, so matching your existing decor will be easy. 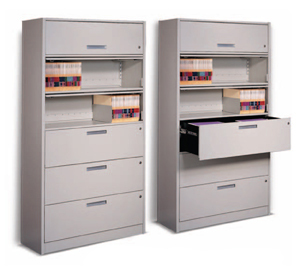 To see the huge selection of filing cabinets we have available, please click here. When you are taking time to redo your office there are a lot of decisions that need to be made. For starters, you will need to choose the color of paint to be used on the walls and also decide what type of flooring (carpet or tile) will match your office space. Next, you will need to choose the décor and these are just some of the things you will need to consider when redoing your office space. And since this is a lengthy process, you will want to ensure that every decision is well thought, so as to avoid any re-work (which can be both costly and time consuming). The furniture will last longer because you are the first to use it. It is easy to find furniture that fits with your specific office style. The furniture will be modern and up to date in terms of style. You get higher quality furniture for a lower price point. There are many unique furniture options out there when you buy used. The furniture will look almost brand new if it’s been properly refurbished. The final decision is ultimately yours. After weighing all the options, you will need to decide which is the best option for your specific budget. If you or your company need help in making that decision, feel free to contact us and we will gladly assist you throughout the buying process. Employee information, even that which only includes potential employment data written on applications, resumes, interview questionnaires and other criteria that divulges any type of personal information, containing SSN’s, DOB, past employment info and other types of sensitive data. Any type of legal information, regardless of the source or situation: cases resolved, solved, unsolved or dropped, this data must be under lock and key at all times. All types of medical data, especially insurance paperwork for new or existing employees, those applying, changing coverage, inquiring about differences, additions and any type of inquiries about employment benefits, must be locked and secured. In today’s digital age, paperwork, signatures and hard-copies are still a necessity and appropriate measures need to be laid in place to protect and safeguard this type of valuable and sensitive data. Insurance audits are also a realistic and regular part of business practices and having a lock in place to protect this type of data can help avoid fines. In a different example, OSHA (Occupational Safety and Health Administration) requirements demand a number of regulations including regular monthly “tailgate” meetings be held for certain industries and they are to be kept on paper, filed and signed off by all employees, supervisors and administrators, on safety and preventative measures dependent upon the industry. For affordable solutions on all types of filing cabinets please contact us today. Speak to an Expert Now!